Mauritius, known officially as the Republic of Mauritius, is an island nation located off the southeast coast of the African continent in the Indian Ocean. It is a volcanic island of lagoons and palm-fringed beaches with coral reefs surrounding most of the coastline.The island is situated approximately 2400 kilometers off the South East Coast of Africa. The island covers an area of 1,865 square kilometers or 720 square miles, with 330 kilometers of coastline. 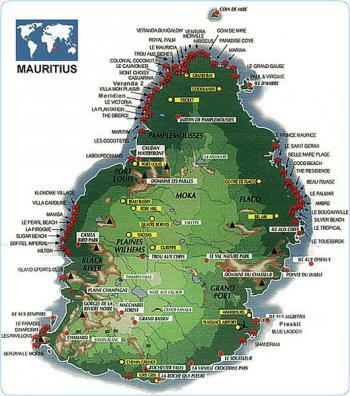 Mauritius is 45km in width and 65km in length. Mauritius is arguably Africaâ��s wealthiest destination, a tropical paradise with tons to do. Port Louis, the modern capital of this 38-mile by 29-mile island, is a bustling port with a revitalized waterfront and a busy market. 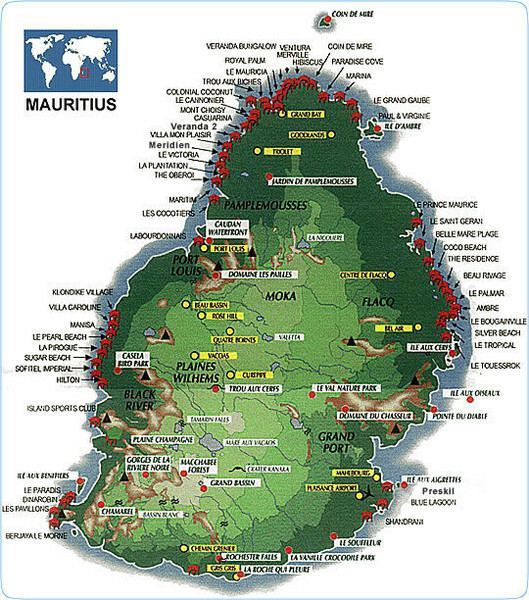 Mauritius is a major tourist destination, ranking 3rd in the region and 56th globally. It enjoys a tropical climate with clear warm sea waters, beaches, tropical fauna and flora complemented by a multi-ethnic and cultural population. Mauritius received the World's Leading Island Destination award for the third time and World's Best Beach at the World Travel Awards in January 2012. It has a reputation for stability and racial harmony among its mixed population. Mauritius is known as a plural society where all the ethnic groups present: Hindus, Muslims, Creoles, Chinese and Europeans live in peace and where all the ancestral cultures have been preserved. These features make the island a unique place in the world, and the Mauritians known for their tolerance and kindness towards all people. What to do in Mauritius? There are plenty of exciting and adrenaline activities to do in Mauritius for every type of tourism. For the eco tourism, they will have plenty of places to explore like waterfalls, trekking, seeing places such as the 7-coloured earths of Chamarel, Black river gorges and sept cascades. There are also numerous water sport activities such as scuba diving, snokelling, kite surfing, parasailing, deep sea fishing, submarine, Flyboard etc.. For the cultural tourism, there are places such as museum, apravasi ghat, Mahebourg waterfront, Ferney, etc.. In mauritius, there are many religious festival such as Maha shivrathree, Holi ( Colourful festival), Eid, Divali where the mauritian celebrate these festivals in a grand way. Moreover, there are many shpping malls in mauritius where tourists can do shopping at a very competitive price compare to their country as it is mentioned that Mauritius is a duty free island. For the nature lover, there are many places that can be explored such as the casela bird park, Ile aux aigrettes, Crocodile park and the botanical garden. You will surely enjoy snokelling at Blue bay beach with the scorching sun. You will certainly be in love with Mauritius and will have the opportunity to experience something new. Most Mauritians are bilingual being equally fluent in French and English. English is the official language, but French and Creole are widely spoken. Oriental languages also form part of the linguistic mosaic. The newspapers and television programmes are usually in French. The country has two seasons: a warm humid summer extending from November to April and a relatively cool dry winter from June to September. The month of October and May are commonly known as the transition months.